Our family-run business, Droveway Kennels is located in the beautiful Wiltshire countryside and set in the estate of a 350-acre farm just south of Cirencester, and onl y 15 minutes drive from the centre of Swindon. Our boarding kennels can be found at the end of a private road, just outside the quaint Cotswold-stone village of Castle Eaton which itself is just over 2 miles from the main A419 Swindon to Cirencester road. We are surrounded by ancient pathways, fields and woodlands, overlooked by the iron-age fort at Blunsdon. Put this alongside our high-quality accommodation, great walks and good food, your dog will be sure to have a fantastic break. Staff are on site, night and day to ensure the health and safety of your pets in our care. And we confidently believe that once you've tried us, your dog will want to come back again, and again! 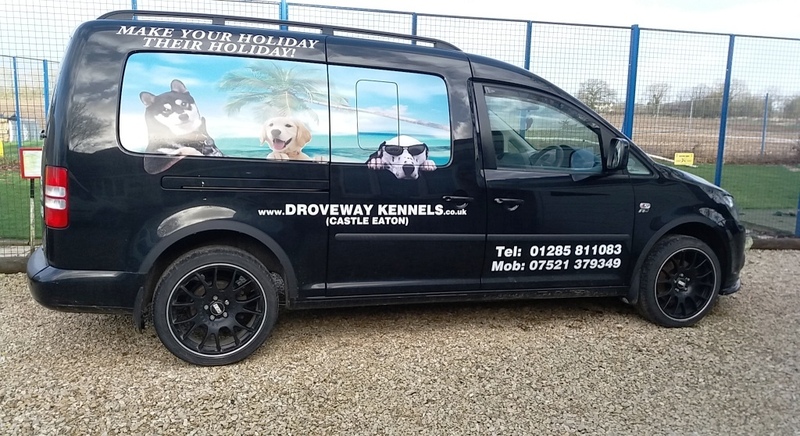 We love to see you when you drop off your pets, but for your convenience we also operate a pet taxi service just in case you need that added flexibility with your own travel arrangements. Simply give us a ring to check availability. 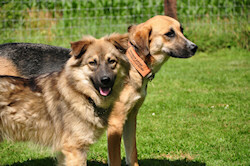 We have two separate kennel areas for large and small dogs, so that the smaller dogs are less stressed. All kennels are heated and have their own individual thermostats. Dogs are supplied with plastic beds of varying sizes and plenty of soft, fleecy veterinary bedding. However, if you wish to bring your own bedding, that's not a problem. However, it's not encouraged as it's hard to keep clean when dogs are in and out of fields on a regular basis. If you do bring your own bedding, make sure it's clearly labeled as it will be washed when dirty. All our visitors are exercised daily on the estate. This includes using one of our two grass paddocks up to four times a day, and also longer walks on the lead with one of our staff. We use long leads so that each dog can enjoy the freedom to roam the hedgerows, paths and bridleways that surround the kennels. If you can, do bring a familiar 'smell' they know, for example a piece of clothing such as a t-shirt you may have worn the day before. This will help them settle into their new surroundings. Dogs are fed twice a day which we serve in bowls provided by our ourselves. We keep a well-stocked larder which includes Earls Dry Mix, Earls Classic, James Wellbeloved Dry Complete, Tinned Butchers Tripe, Tinned Chappy, Tinned Earls - all flavours - Bakers Dry and tinned, Pedigree tinned and two sensitive dry mixes. However, many owners decide to provide their own to avoid changing a familiar diet during their dog's stay. If your dog is a fussy eater or has a sensitive tummy, this may well be wise. If you do provide your own food, make sure it's clearly labeled along with any relevant instructions. We have fridges and freezers for the storage of fresh foods, and we can even cook food if needed, but there will be an extra charge for this service. Call Droveway Kennels on 01285-811083 today to check on rates and availability.